Silly moments, selfies, wedding bliss, and WILD dance floor moves - all behind the scenes from Lena's 2017 season. 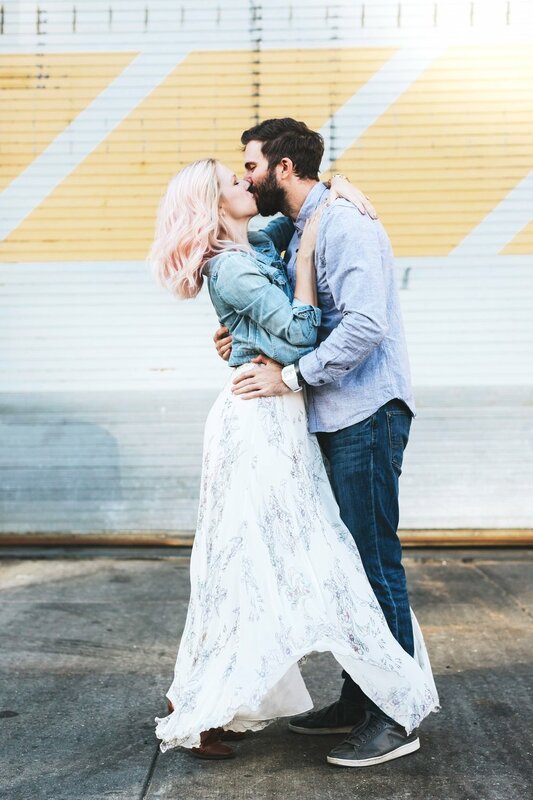 I've had the surprise and pleasure of being featured by the Huffington Post / HuffPost Weddings this season, and I wanted to share my amazing couples with you! Megan & Tony's adorable wedding photo was published this July on The Huffington Post - see it live HERE! And HuffPost Weddings posted one of my favorite photos from Holly & Ange's Downtown Boston wedding at Central Bistro in June - link HERE! This Sunday, I'm so excited to share this awesome feature with you! The lovely ladies at Planned Perfectly named me the vendor of the week this week - and I'm so honored! You can read advice on how brides can maximize their wedding planning process and special day, learn about my favorite wedding styles, and take a peek at how all the behind the scenes of wedding booking works. Never fear! Here is a handy guide to help you through the process! White shirts and khakis? Not anymore. Find a palette and coordinate using that - if you love light, bright fabrics in photos, then creams, whites, light pinks, and beiges will look great. Mix and match tops and bottoms in that color, but have some of the family in jeans, one in a cream lace dress, another in khaki pants and a patterned pink button up. I'm not as much of a dress girl - I buy them and never end up wearing them. BUT, when I'm being photographed, I'm usually in a dress. I LOVE the way dresses photograph whether it's in a field or in a city. Solids are great, and so are patterns! The trick is to coordinate them well. Majority solids, minority patterns. Coming with your partner? Mix a patterned dress with a pair of jeans and a solid button down. Or, if she's wearing a solid colored dress, he can wear a plaid shirt with grey pants. When in doubt, especially for guys - plaid is always a yes. Thin stripes are great, too! Textured clothes look fantastic on camera. Instead of a plain button down, think about wearing one with a textured stitch and little speckles throughout. Lace is my favorite texture - it photographs SO beautifully! And sweaters? YES! Fuzzy knitted sweaters for the chillier months give outfits delicious texture. Especially in colder months, layers are great. They add great dimension to photographs. Wearing cardigans over a blouse, a jean jacket over a dress, textured socks coming out of boots... it gives you a second look without having to change clothes. Steer away from any kind of formal wear for adults. No dressy shoes or dress pants, NO ties... but for kids, suspenders on little boys and bow ties make me melt! Dresses and bows on little girls are way too cute, too. It's important to think about the environment you're being photographed in when it comes to colors. Across the board, I recommend lighter and more neutral colors. Creams, pinks, beiges, mustard/golds, and whites. These colors look especially fantastic for golden fields and forests. Natural settings = earth tones. If you're running around Boston with me, pops of color are fantastic! The city is more grey/blue/silver, so a bright pop of mint green with an orange statement necklace and some bright heels is great! Go with a color slightly off from the color wheel - mustard instead of bright yellow, maroon instead of bright red, navy instead of blue. Stick with lighter, not darker. No the time to wear all black! And above all - NO neon. It makes color casts onto your face, so steer clear! The funny thing is, shoes aren't really seen much - unless they stick out like a sore thumb. This is not the time to wear Nike's! Classic sneakers like Converse or Vans are always in style, sandals for ladies but no flip flops unless we're kicking it at the beach! Cute boots are a must for the chillier months. Most frequent comment I get about wardrobe after a shoot - "Crap, my bra straps were showing!" I'll always let you know, but to fix this beforehand, if you're wearing an off the shoulder shirt and want them in the photos - great! If you don't want your straps peeking out - wear a shirt that from every angle in the mirror, doesn't pop out. This includes from the back, sides, and front. Wear a strapless bra if it's a problem shirt/dress or if it's the band by your underarms showing, wear a bandeau over your bra. You want your clothing to compliment YOU, not the other way around! Choose something you feel absolutely amazing and totally comfortable in. Your smile, your laugh and your face is the main event, not the clothing. The clothing compliments you and your personality! You're bright and bubbly and love polka dots? Show me polka dots! Preppy and love all things nautical? Hand over the J Crew catalog. Low stress - wear what makes you feel amazing. I had the honor of interviewing for Rock the Shot a few months ago, a professional photographer's online forum resource. I've been reading Rock the Shot articles for years; I've always loved them! Fast forward to last night, and I found the article was posted on June 1st - I COMPLETELY missed it! I've been patiently waiting for it to go up, only to find it already was! SO without further delay, my wonderful feature! It’s often been said that mathematicians do their best work when they’re young, philosophers when old, and photographers…? Lena Mirisola’s does what most talented young creatives do – explore and blur the boundaries of art and life. There’s plenty of learning that comes with “Experience”, but as we get older, life can become more compartmentalised, the lines drawn by different commitments and responsibilities. The creative fearlessness of youth is due to a willingness to explore and extend boundaries, which is one of the drivers of Mirisola’s talent. As she says, “My commercial work is a true extension of my personal work. My Young Wild & Free series was all shot for myself. They all went into my book to show to advertising agencies, but I didn’t shoot ‘for my book’ or ’shoot for stock’” It’s what gives the images such character and warmth. We asked her about the one lesson she took from college and it turns out that that she is her second year studying photography at the Massachusetts College of Art and Design Art. Her work is is a great vehicle to explore our current theme of the ‘Local’, and if the photography feels very immediate, it’s partly because Mirisola’s models are people that she knows. This sense of the local, the immediate, is partly due to to how she captures her models/friends interacting with the space and may be due to the sense of freedom imported from her experience of regularly shooting on film. She describes the thrill of film, compared to digital, is that you are not in control and yet her digital work still feels loose, relaxed, open. So is photography an art of the young? Or the old? As writer Geoff Dyer has aid, photography has always been the art of abundance. And most of all for the viewer, photography has always been an art of surprise, of seeing yourself captured in a moment in time, from the landmarks of the family photo to the improvised performance of the selfie. Mirisola’s eye is a young take on the art of surprise. Today, standing in the always long sandwich line in the cafeteria, I received a wonderful email. I read it with a gigantic smile beaming on my face while everyone waiting for their footlongs gave me odd looks. My interview and feature for ImageSource is LIVE! I was so humbled when I was approached to do this, and even more excited when I got the list of questions. I love what the did with the article... they chose most the photos, not me! They're perfect. Check out the rest of the interview HERE! And the biggest heartfelt thank you to all my amazing models and friends. Seriously, this one's on you guys. Flights booked, French translator books acquired, Free People black lace dress purchased. I'm going to EUROPE for the first time! This July, Miss Barb and I are flying to Toulouse to meet Ellen, Cat, Anne Marie and Frances to stay for a week in the South of France in the small village of Boutenac in a beautiful villa overlooking hills and fields for an artists retreat. We'll be taking day trips to Provence to see the lavender and sunflower fields, and to Barcelona too! SPAIN! After a week, we're driving up to Paris to see the magical romantic city, staying overnight, then Miss Frances (an incredible young photographer, 20) and I are taking a train to her family's home outside of London! I'm so lucky to have a network of amazing people to connect with - she'll be showing me around London for a few days then I fly back home from there. A lovely two weeks eating bread, bread, and more bread and taking THOUSANDS of pictures. I'm so excited! My mom & auntie pushed me to do this and helped with everything, too - a huge THANK YOU to the most supportive parents I could ask for. I am signing to Image Source, a pretty cool & fresh stock agency based in London & NYC. I was contacted by one of the art directors to shoot for them. She found me on Twitter (of all places) and ended up on my website, reading that I loved to pretend to cook like I'm a Food Network pro... it's true! Honestly, it's incredibly honoring to know that I'm doing something right. Like "Hey world, I'm Lena, this is what I love to do and I'll rock it for you!" I'm looking forward to shooting boys now... it feels so weird submitting photos of them! SheStock is all women, so I've been girl crazy the past year. The majority of my shoots will still be for SheStock, but I'll be setting aside more of my time to provide fresh content for Image Source. Because they're super cool too! Juggling three agencies will be a challenge, but hey, I'm young, right? It just means more shooting, more meeting fabulous new people and producing more great imagery.